There are two things that remind me of the holiday season from my childhood. The first are those cherries covered in chocolate. You buy them by the twelve pack. They are cheap and probably not good for you but back in the day I could house a pack a day. I was a pack a day chocolate covered cherry eater. The second thing is eggnog. Until I got into cooking more, I had never had real eggnog. By real, I mean homemade. I grew up on the stuff in the carton. Carton-nog. And I absolutely love that stuff. I can drink it to this day without a problem. But the store bought eggnog and the real stuff are almost not even the same drink. The store bought is sweeter, thicker, and richer. The stuff in the above picture is light, spicy (nutmeg), alcoholic (Holidays! ), and has just a touch of sweetness. So you might think that you don’t like eggnog, but you might just not like carton-nog. The real stuff is an entirely different beast. The second important note about making eggnog is that it is traditionally made with raw egg. This bothers some people, so the version I made here solves the problem by tempering the egg yolks. If done correctly, you can’t really tell the difference. This version still has raw egg white in it though. If you want to be even safer, you can use pasteurized eggs! If you want to try it with all raw egg though, just skip the step about tempering and combine everything together. However you make it, this perfect homemade eggnog should be on your table during the holidays. The first thing you need to do is separate your yolks. They make tools for this, but I would include that in my ever-growing list of useless kitchen appliances. Just break the egg in half and slowly roll the yolk back and forth between the two shell halves. Do this over a tiny bowl to catch the white. Then pour the yolk in one bowl and the white in another. Now. Why can’t you just do all of the eggs over one bowl and catch all the whites at once? You can if you are a gambler. Because if just one drop of yolk infects your whites you have to start all over. They will never whip up. Why? Because fats and whites don’t mix. It’s science. I know because I’m a gambler. Put the whites in the fridge and start with your yolks. If you don’t have a mixer then get your favorite whisk, but man you are going to have a tired forearm by the end of this. 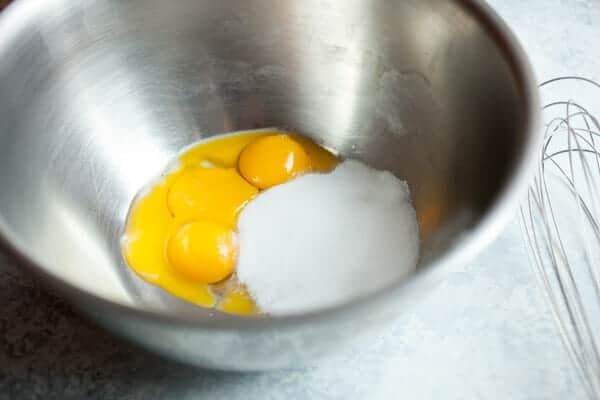 Mix the yolks and sugar together until they lighten a bit in color and grow in volume. Now combine your milk, cream and nutmeg in a medium saucepan and put it on medium heat. If you don’t want to pasteurize your yolks, skip this step entirely. Heat this to just below boiling temperature. Probably around 170 degrees. You shouldn’t be able to keep your finger in it. 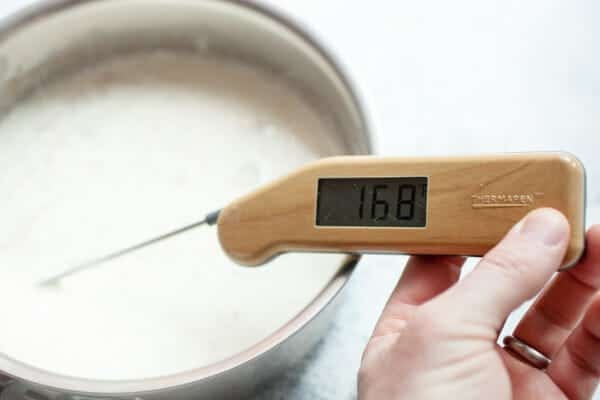 If you have a nifty instant read thermometer, you can use that! Then for the tempering part. Slowly drizzle in a cup of the hot liquid into your eggs. Keep mixing the yolks while you do this. Sorry I didn’t take a photo but I don’t have three hands. Don’t stress about it though, it isn’t too hard. 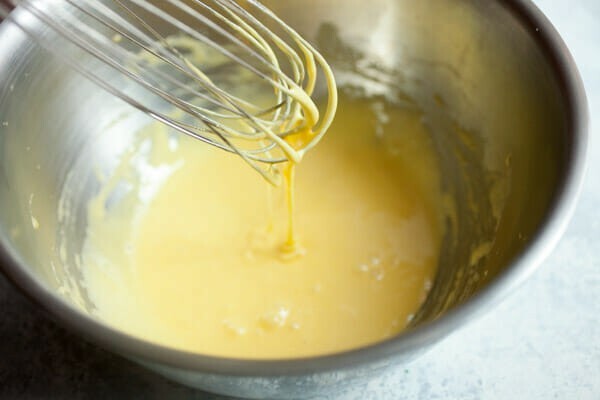 Then once your cup of hot liquid is mixed in with your yolks, your yolks will be up to temperature and you can slowly add them back to your saucepan. If you don’t bring your yolks up to temperature, your eggs will cook when they hit the hot liquid. Scrambled eggnog is horrible. Now put this back on the burner until it reaches 160 degrees. Keep whisking it and it will only take a minute or two. You can then be assured that your eggs are safe. 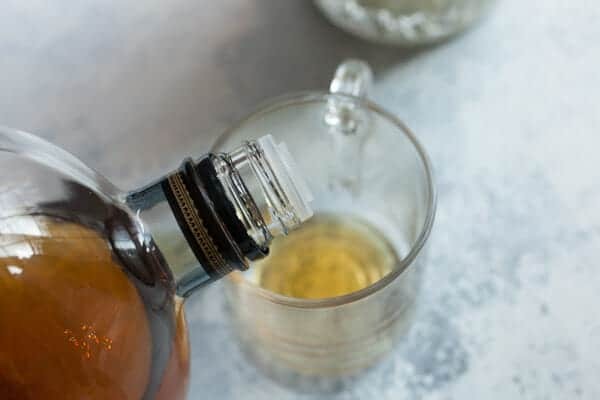 Add in your brandy if you are using it and stick the mixture in the fridge to chill out. As a shortcut, you can place the mixture in a mixing bowl and put it in a larger bowl with ice water. Whisk the hot mixture and it will cool down rapidly. In the fridge though, it’ll take an hour or two to chill and then you need to prep your egg whites. These are even easier assuming you didn’t contaminate them with any yolk. Just mix them up with a mixer until they are fluffy. IMPORTANT: Be sure to wash your mixers really well before you do this. The little bits of yolk from the earlier job will wreak havoc on your success. Copper bowl helps, but not necessary. 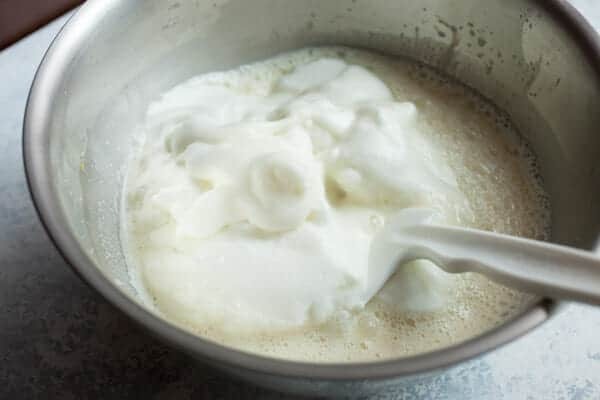 Once the whites start forming little peaks, add in that extra tablespoon of sugar and keep mixing until you get stiff peaks. Finally, once your milk base is chilled, fold your whites into your milk base and you have the best eggnog ever. Super light and delicious. One more note. If you mix your whites an hour or two in advance that is okay. Just be sure to whisk them together for a minute or two before you add them to the milk base because some liquid will probably separate out. Don’t forget the bourbon also! 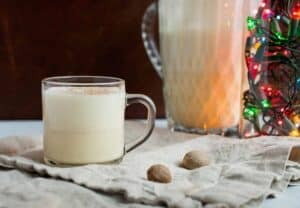 This recipe isn’t that hard, and it produces a drink that is vastly different from store-bought nog. 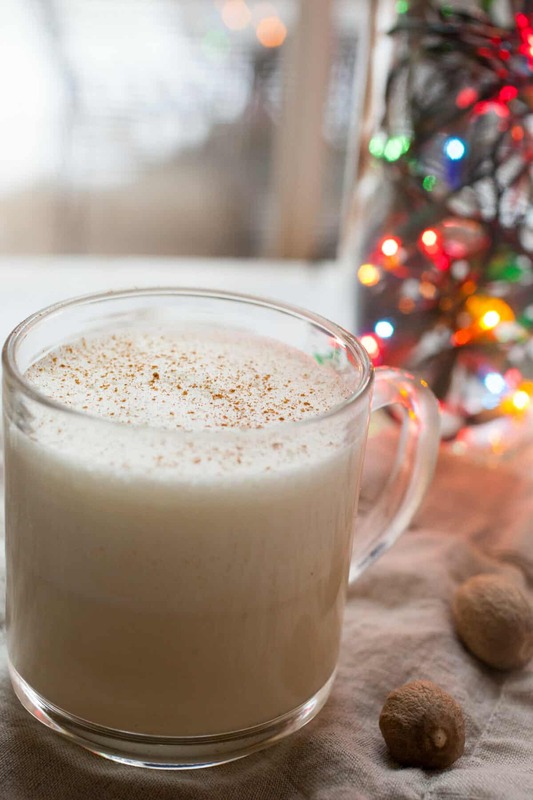 Homemade Eggnog a great way to celebrate the holidays and your guests will be very thankful. I thought I didn’t like egg-nog. It turns out I only don’t like carton-nog. I can’t stand it. I would probably have never even made the real stuff if it wasn’t for a friend who wanted some homemade nog but was too lazy to make it. I am very glad I stepped up and made a batch. I can get behind the stuff 100% now. Oh Nick + Alton Brown= amazing eggnog. AND, I haven’t seen a drop of this stuff here in Sofia, Bulgaria. @William Pretty much anyone I meet who says that dislike eggnog has not had the real stuff. It’s easy to convert people because two things are on separate planets. They make a contraption for separating egg whites? I have no clue what that contraption would even look like… I don’t believe it…. Wow. This year I’m seeing so many recipes that use heat / cooking in them – I don’t worry about salmonella myself but most of the no-cook recipes I’ve tried turn out to be pretty thin, so I’d like to try this to see to what extent it adds body to the product. Have you done this both ways, and was there a noticeable difference in the results? Thanks, I must give this eggnogg a try. Its been years since I had the store bought nog, and have really never taken time to make my own. So, tomorrow will be the DAY! But, am I to keep my finger in the mixture til I can’t stand the heat anymore? LOL, sorry, just reminded me of a redneck thermometer! I really do appreicate the recipe its just that the mid term exams and the holidays are already getting to me. Think its safer I skip the addition of rum. Haha. No. ;) I just mean that if you stick your finger it in, it will be too hot to keep it in for more than a second or two. Definitely a red neck thermometer! I still make this recipe at least once a year. It’s a bit of work, but definitely worth it. Much better than the store versions. What I would like to know is how far ahead can you make this? I’m the only nog drinker in my household and I don’t think I could drink an entire batch at one time. Hey Jasper, I’ve never kept it for more than a few days. It’s been good, but because of the raw eggs I’m not sure I’d keep it longer than that. You can easily make a half batch also. I am enjoying your site, Nick, and have sent the link to my mother and daughter as well. Like you, I enjoy store bought eggnog. I also appreciate the real deal and I will certainly try your recipe. 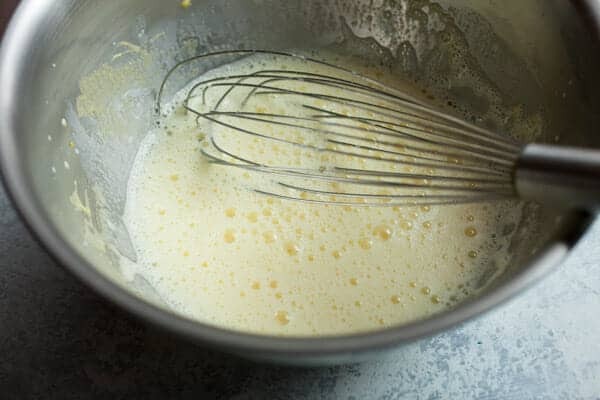 Now (a very backward question) if you were to try to whip up a batch of ‘store bought’ eggnog–say because your grandsons all love it and sometimes ask for it when it is not ‘in season’–how would you do that? I’d be very interested to see what you would put together because I am totally stumped when I try to guess at what the recipe would entail. I’m not sure there’s a way to make it… if that’s specifically what they want I would just buy it I guess. I’d add 1 teaspoon real vanilla to the mix and it would be perfect!! I love both kinds! I was wondering if you could put just a tiny but of cornstarch in the cooking process to make it a little thicker. I never cooked mine just beat eggs, sugar, vanilla, nutmeg & milk together. A little Rum is good also! I was lately craving some eggnog but didn’t want to buy the ones in the store because they have a lot of additives. Now I can make some. seems easy. I’ve been making eggnog since 1972 useing my granfathers recipe. I do temper my egg yokes now. 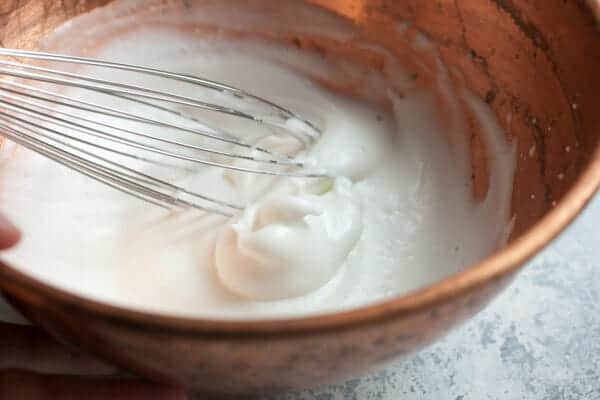 And my recipe includes vanilla and whip cream whipped. I fold the egg whites into the mixture. The eggnog is very rich & I keep a plastic spoon in my cup to stir now and then. I also use the top of the mixture where it is very thick to use on pies. I only keep in the frig about 3-4 days. I never knew my grandfather but I think of him everytime I make his eggnog. Great story and recipe Steve. Thanks for sharing! Nick, what do you mean you don’t have 3 hands?! This is where your kids start becoming useful! I remember my Mom making eggnog once when I was a kid (non-alcoholic) and liking it, but I really can’t stand the carton-nog. I’m puzzled about the raw egg issue, though. Even though you cooked the yolks, the whites are still raw. I don’t see the point of cooking half of the egg (unless there is some texture difference, as others have mentioned). It seems to me that if the egg is contaminated with bacteria, it would be contaminated in both the white and the yolk. Am I missing something? Hey Lisa! Yep… there is still some danger in consuming raw eggs. There’s no way to cook the whites really without completely destroying the texture but you can buy pasteurized eggs which are much safer if you’re worried about it! I might adjust the post a bit to make that clearere! Hope that helps! Hey, Nick! This looks great! Homemade eggnog became a staple when we lived overseas and couldn’t buy the kind in the carton (which I love, in its own way.) Have you ever tried aged egg nog? You have to plan ahead at least 3 weeks from when you want to drink it, but it’s easy, and delicious. The alcohol basically kills any potential salmonella in the raw eggs after 3 weeks in the fridge. Maybe something to ponder for next year’s holiday planning :) Thanks for the consistently great recipes and writing! Whoa! I’ve never heard of that Rachel. THanks for the tip. Gonna try it next year for sure! Hi! Thanks for the recipe! I made and drank my first eggnog ever (it’s not a commong thing here in the Netherlands) and it turned out good, I think. I did add some cinnamon and vanilla beans for some extra flavour and both the alcoholic and non-alcoholic version (we split the batch in two to accomodate everyone) tasted great! Only trouble I had was folding in the egg whites properly. I still had some floating egg white islands in the nog, guess I was a little too impatient for wanting to try it out! Awesome! Glad it worked! Don’t worry about the egg white “islands”! Happens to the best of us. I always just give mine a quick stir before pouring to combine everything nicely. Thanks for the comment! I’ll have to give this eggnog a try–even though it’s well past Christmas. For Christmas I made my Lithuanian inlaws some good ol’ American eggnog and used an Epicurious recipe, but we found it a bit too sweet. Will have to give this one a try! I thoroughly enjoyed reading this recipe. And what a lovely pitcher!